At Home with Chas: Hot. Fresh. Doughnuts! Is there anything more yummy than a plate of hot, fresh, doughnuts? This weekend did not disappoint my family! Don't be disheartened if you are not much of a cook yet, or you are a little intimidated about making doughnuts from hand. It is very simple and I'm going to show you how. The thing is, share this with your family! Bless them and include them in what you do! I going to give you 3 ways of making doughnuts! This first recipe is our recipe, but I do want to try the sourdough one that I am going to post next. 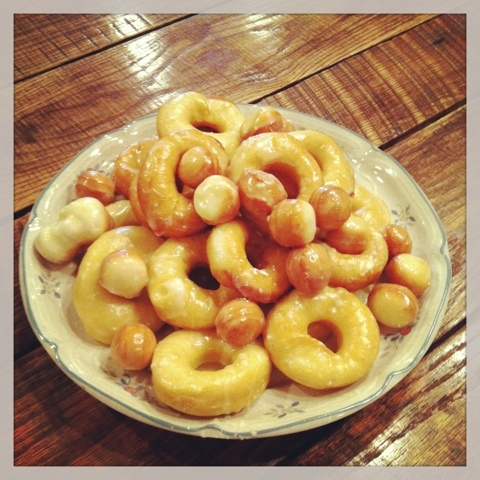 And then the last recipe is for a very quick and easy way to make donuts! Dissolve yeast in warm water and let it sit and bubble for about 5-10 min. Depending on how warm your home is will determine time. Nothing exact. Add milk and butter and mix in with the yeast and water after yeast is bubbled. Mix flour and sugar together and make a well in center. Pur wet ingredients in center of well, add egg. Begin mixing until dough forms a ball and turn it out on a floured surface to knead. Add a little flour if it is too wet. Add a little water if it is too dry. This is a great project to learn how dough should begin to feel. The dough should be smooth and have some elasticity, meaning it will stretch. Let the dough rest for an hour in a warm place. When resting time comes to a close you want to start heating up some oil. You don't have to have a big deep fryer for this project, you don't even have to have a full pot of oil. I use a small pot and fill it about half way. I do have to take a little longer to do it, but oil is expensive and I don't do this very often so I hate to use too much. Roll one quarter at a time. You don't want this too thin. Remember we are making donuts. But it will puff up in the oil. I used a biscuit cutter for the doughnut shape and then I have a little metal piece that I think came off my sink, haha, I keep it to cut out the doughnut holes. It works perfect! At this point you could let your kids be rolling the dough and cutting out the doughnuts while you fry. I don't allow my kids to use hot oil like this. So the frying is definitely Moma's job! I don't even like my kids to get close while I am frying because the way the oil can pop if it gets too hot. So if they are happily cutting out the dough at the table you can prevent a problem. Fry the doughnuts until they brown and plump up and then gently roll them over in the oil and brown the other side. Don't forget about the doughnut holes too! Make sure you fry them up too! I like to have a plate with a couple of cloth napkins so when I dip the doughnuts out of the oil the excess oil drains on the napkins. Once the doughnuts are dry then it's time to flavor them up. The standard way to glaze a doughnut is to use a simple mixture of powdered sugar and water. I bumped mine up this last time and used powdered sugar, cream and vanilla. I do not measure this. Just dump a bit of powdered sugar in a bowl, add a tsp vanilla and then add the cream, milk or water... whatever you like in small increments and mix. Once you have a smooth consistency, stop. You don't want it soupy or watery. I then put the doughnuts in the glaze and flip them over so they are coated and place them on a clean plate. It may sound like a lot, but it is really quite easy and a lot of fun! Prepare a frying pan with enough oil to fry in, and allow it to reach about 360 degrees. In a medium bowl, whisk together the flour, baking powder, baking soda, sugar, cinnamon, and salt. In a large bowl whisk together the starter, oil, egg, and milk. Mix the wet and dry ingredients together, until they just come together. Sprinkle some flour on your counter and dump the dough out of the bowl. Knead it gently 3 or 4 times until the dough comes together. Sprinkle the top of the dough with a tiny bit of flour and roll out until it is 2" thick. Cut your donuts out, reforming the dough back together as often as you need to. Fry until golden brown, just a minute or two on each side. Drain/dry on the paper towels, and then coat as you see fit - powdered sugar, cinnamon and sugar, or glazed. Pop open a can of biscuits and separate. With small tool, cut hole out of center of biscuit. Fry in oil til plump and brown. Cool and glaze. Glaze doesn't have to consist only of a powdered sugar and water mixture. You can spread a little honey and butter on the doughnut. The possibilities are endless and totally up to you! I hope you enjoy the time with your family and whatever yummy creation you come up with in your family kitchen!